It's New Year's Eve, and I have a special end-of-the-year treat: an interview with pre-Shortzian constructor and chemistry professor Mary Virginia Orna! I first wrote about Mary Virginia Orna back in May of 2014, after project historian Todd Gross had uncovered some interesting information about her and a number of other constructors. According to my (incomplete) records, Mary Virginia published 28 pre-Shortzian puzzles between 1979 and 1988, and I'd been meaning to try to contact her for some time. I finally did recently and was delighted when I heard back from her! A professor of chemistry at The College of New Rochelle in New York, Mary Virginia has had a lifelong interest in languages. 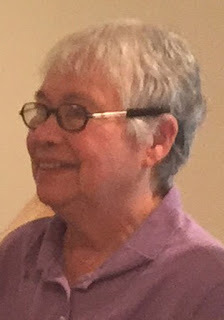 To learn more about her, first read her fascinating article on crossword construction, "Always a Cross(ed) Word," which I've posted on Scribd, and then my interview with her by clicking on the Pre-Shortzian Constructor Interviews tab above or here. I've also posted Eugene T. Maleska's edits of Mary Virginia's "Mayhem" puzzle, which was originally published on May 12, 1985. Will Shortz showed them to me a couple of summers ago when I was researching pre-Shortzian constructors and let me make a copy (thanks again, Will!). Enjoy! It doesn't seem as if .puz and .pdf versions of the puzzle are available at xwordinfo.com. Are they available anywhere? Thanks for spearheading this wonderful resource. I solve several pre shortzian puzzles every week (mainly those published on friends' birthdays) and I am convinced that it is improving my solve times for current NYT puzzles. And please convey my appreciation of the puzzle to Mary Virginia. Thanks for the interesting Web pages as always, Ralph! The .puz file and PDF aren't online anywhere, but like with all the other pre-Shortzian puzzles, it can be viewed and solved on XWord Info. And I'm glad to hear you're enjoying the pre-Shortzian database so much! I'll be sure to pass your kind words along to Mary Virginia. In the meantime, Happy New Year! Too bad there isn't an option to solve on paper. Older solvers might feel more comfortable wielding a real pencil to the puzzle.